This one is important because we lock in scale because of the surrounding trees it is working around. There can be no dispute for size and its relative motion either. Better yet it is also associated with a mountain region and associated updrafts as well as a number of jittering lights in the adjacent skies. The sting ray shape is excellent for navigating what is essentially an airbag full of methane and has been observed before. As i have posted, i posit the existence of slime mold creatures able to create an methane bag in order to easily rise in the atmosphere all the way into the the stratosphere above the active atmosphere. Mountains would provide an excellent acceleration ramp in order to gain altitude out of the lower atmosphere. Of course we would fly through them without notice except for occasional blobs of slime on the local lawn. They seem to have some capacity for mobility although the rapid movements seen are from jumping local air currents. 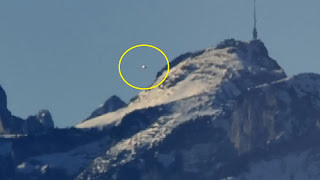 They are plausibly responsible for the majority of the more obviously benign UFO sightings. I have actually seen one catch the setting sun while jittering off a mountain peak.